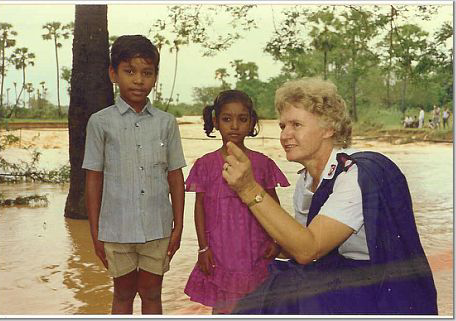 The relationship with the Indian sub-continent grew out visits as medical adviser during the 1980s once Paul and Margaret had secured British nationality and the accompanying passports in 1984. Following leadership of the India Strategy Commission came appointment as leaders of the India Central Territory in 1990. Early during their tenure of office a major cyclone hit the east coast and Andhra Pradesh. Cyclone Resurrection expresses the anguish, but relentless spirit of those affected. It was contact with the excluded poor of South Asia that led to On Becoming Poor and in later years to convening The Salvation Army’s Poverty Summit, held on the internet because of the fears of further terrorist attacks shortly after 9/11. The Salvation Army in South Asia reflects great pride in the people of the sub-continent and their place in the international Salvation Army. On Visiting Disneyland ends up with a spiritual dimension. The secular and the spiritual blend imperceptibly; Christ can be discovered everywhere.